Ein Kerem Merlot Sira wine 2006 (barcode 7290003541430) states it is mehadrin min ha’mehadrin under the supervision of Rabbi Dov Lior Shlita and the OU USA, kosher of Passover. An inspection reveals the wine is a fraud and it does not have any kosher supervision. (See photo 1 on the left side in the original document at the end of this article). 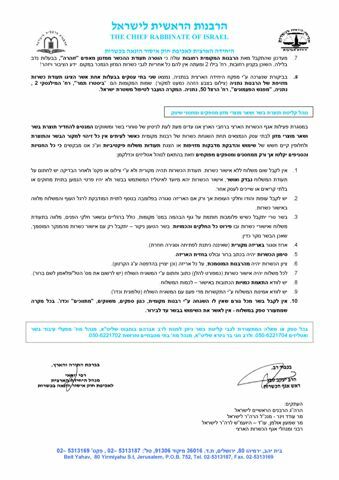 Chief Rabbinate inspectors have learned some farmers are selling goods with forged bills of lading claiming the produce is “kedushat shvi’it – Otzar beit din” while in actuality, there is no kashrut supervision at all, not on matters pertaining to tevel, orla or shmitah. This bogus forms have legitimate-looking stamps and may easily fool a non discerning eye. The Rabbinate points out that shmitah has all but expired on most items and therefore, buyers should be aware that laws of trumot and ma’asrot are applicable once again and one must always remain alert to the matter of orla (fruits of the first three years). (See photo on the right side of item 2 in original Hebrew document below. The Jerusalem Rabbinate has learned that raisins sold under the name Tali’s Raisins, from Moshav Lachish, marked as kosher mehadrin under the supervision of the Jerusalem Rabbinate are bogus. The factory states the mehadrin stamp was affixed accidentally. The Zichron Yaakov and Jerusalem Rabbinates report the supervision has been revoked from the Alei HaSharon Company producing bug-free greens. It appears the company fails to comply with the protocol set forth by the Chief Rabbinate of Israel for growing bug-free greens. The kosher supervision was removed from the Zohara Restaurant (2 Bilu Street) by the Rechovot Rabbinate. 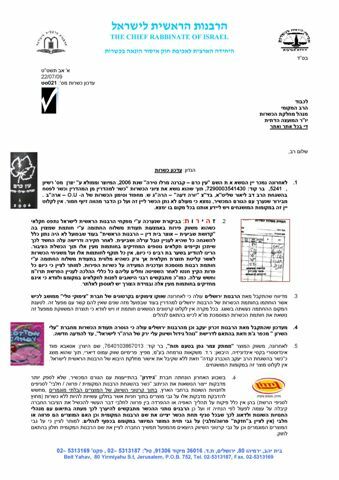 Two different businesses under the same owner have been displaying bogus kashrut certificates from the Netanya Rabbinate, using a quality photocopy that is difficult to distinguish from the real thing. This refers to Bistro Bar (2 Milinski Street) and Mifgash HaPa’amonim (50 Herzl Street). The matter has been handed over to Israel Police. The remainder of the update addresses the receipt of meats by stores and wholesalers. This portion is not being translated. It may be viewed in the original Hebrew document below. Posted on July 26, 2009 by JKN Israel. This entry was posted in 5769 - 2008/2009, Chief Rabbinate Updates. Bookmark the permalink.